Style and fashion icon Dev Anand with his city-slick and charismatic persona left behind a rich legacy of films that are still loved for their superior camera work, exceptional direction, some of the best ever performances, excellent scripts and dialogues, style and fashion, exciting new discoveries, locations and beauty of scene concepts, cinema of high hopes and spirit and of course and all the music and the songs. We remember the evergreen hero through a journey down his illustrious repertoire. The rare pictures used in this article, unless specifically mentioned in the caption, are courtesy the Collections of SMM Ausaja, renowned film historian, archivist and memorabilia collector. Movie stills are courtesy the Internet. Har fikr ko dhuyen mein udata chala gaya. For a man who was part of the Indian cinema for some 65 years, acted in over a 100 films, directed some 19 films and produced over 40, media has written and divulged almost everything there is to the man. In my tribute this year to the greatest entertainer we have had I have decided to look at some figures. My brother, Shanu Dev, who works as a dubbing artist and voice over in the Mumbai film world, was close to Dev Anand. He has acted in a few Dev films, like Censor, Sau Crore, among others. Through him, I had sent a message to Dev Saab in early 1998 and seek his reaction. There were two parts of this message, first, that Dev Anand stands out as the hero in Hindi cinema who has the best music/songs to his credit going by quantity and quality. 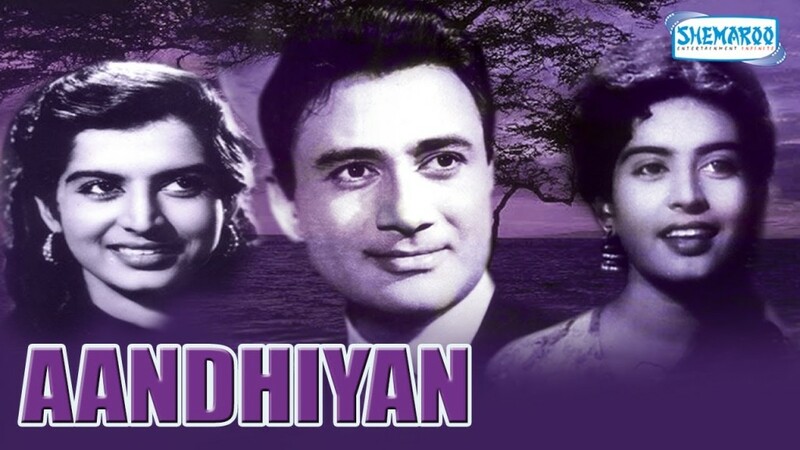 Next, if he had allowed his brother, Vijay Anand to direct most of the films that he did himself, we might have had some more class cinema to connect with him. Well, Sir, you are gone into the other world and for us who love your films, that last 20 years of your cinema has remained a regret. But, the other 45 years of your films, we love everything, the films, the superior camera work, exceptional direction, some of the best ever performances, excellent scripts and dialogues, style and fashion, exciting new discoveries, locations and beauty of scene concepts, cinema of high hopes and spirit and of course, all the music and the songs, a testament to its terrific legacy. 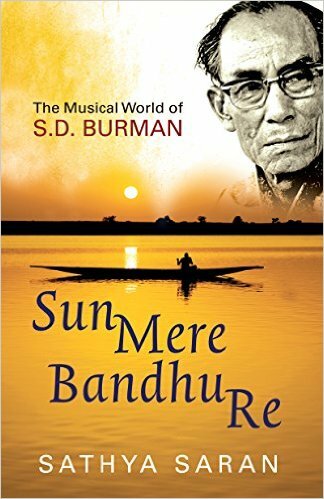 For his music, as one would guess, he had Maestro Sachin Dev Burman score music for 28 of his starrers. I recall only one, Ek Ke Baad Ek, with weak music. Rest all had excellent score and songs that we relish even after all these years. From Baazi, Jaal, Sazaa, Taxi Driver, Munimjee, Paying Guest, Nau Do Gyarah, Kala Bazar, Bombai Ka Babu to Guide, Jewel Thief, Teen Deviyan, Gambler, Tere Mere Sapne and Prem Pujari to name a few of the 28 films that contained 210 songs – if I start listing these songs, readers would hum along at least 90 percent of them. Such a lasting impression they have had. At one time in the history of Hindi films, ‘Yeh raat yeh chandini phir kahan’ (Hemant Kumar / Sahir Ludhianvi / S D Burman / Jaal, 1952) was hailed as ’the most romantic song of impulse ever’. Whether you talk of the scene on screen or just the audio – the impact was tremendous, of equal strength. I remember screening Jaal at one of our monthly meetings of the Vintage Hindi Music Lovers Association in Bangalore in early eighties. We had a packed house of approx. 250 members of which there were over 140 women in the audience. After the screening a question was posed to the women in the audience as to how they would react if they were in place of Geeta Bali when Dev starts stringing his guitar and croons Yeh raat yeh chandini phir kahan. I don’t think I have seen a more unanimous response from public declaring that they would be reacting just as Geeta Bali did. What an impact that song had even after some thirty years of its making with some in the audience having viewed it many times before. 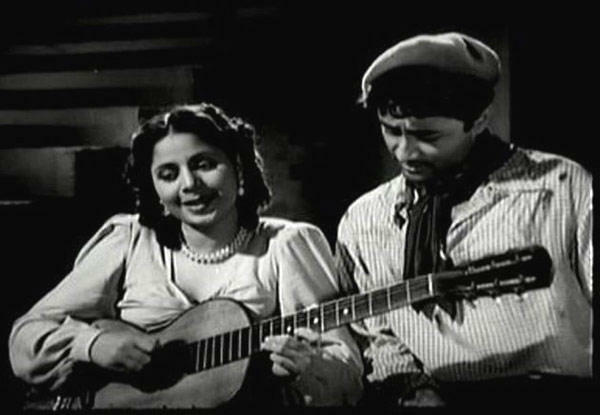 Not only was the music, the lyrics, the singing that left that impact, it was also the performance of the lead artists (Dev and Geeta Bali), the direction by Guru Dutt and extremely polished and reverberating cinematography by V K Murthy that all contributed in their might. Dev Saab, no one can take these memories away from us. Dev Anand and his Navketan had the courage and conviction, vision as well, to allow Dada Burman all experimentation that the maestro wished. It always worked wonders. It was a team work par excellence. The non-mukhda starting of ‘Kaanton se kneench ke ye anchal’ in Guide (1965); exceptional use of percussions and uncommon beat in ‘Hothon pe aisi baat main daba ke chali aai’ in Jewel Thief (1967); soft and slow start to regular interjection by Kishore in ‘Khwab ho tum ya koi haqeeqat’ in Teen Devian (1965); the recitation and singing combination by Geeta and Rafi in ‘Chupke se miley pyase pyase kuchh hum kuchh tum’ in Manzil (1960); Asha Bhosle humming in Kishore’s O nigahen mastana in Paying Guest (1957) and Hemant Kumar’s humming in Lata’s ‘Peechhe peechhe aake chhu lo hume paa ke’, in House No. 44 (1955); the conversion of a ghazal into a club song in Baazi ‘Suno gazar kya gaye’ (1951); the nazm recitation of ‘Dil aaj shair hai’ by Kishore in Gambler (1971) are just a few examples of the musical liberties Dada Burman took in a Dev film. 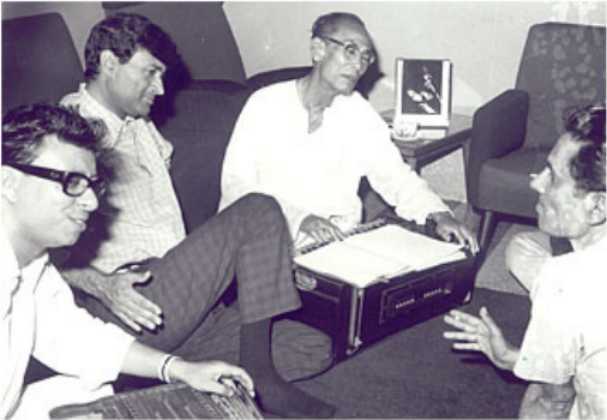 In Nau Do Gyarah in 1957, Dada Burman had tried the same formula to mix Rafi and Kishore as his playback singers as he did twelve years later in Aradhana (1969) – two Rafi duets, one Kishore duet and a Kishore solo in Nau Do Gyarah and two Rafi duets, one Kishore duet and two solos for Kishore in Aradhana. Had Kishore not been tied down with Madhubala’s health issues, he would have gained substantial popularity in the late 50s itself. Sheer misfortune made him lose ten years. The naughtiness and the mature handling of the songs in Nau Do Gyarah established Vijay Anand, all of 22 years of age, as a force to reckon within Hindi cinema. Aankhon mein kya ji (Kishore, Asha) O, Aaja panchhi akela hai (Asha, Rafi), Hum hain raahi pyar ke humse kuchh na boliye (Kishore), are absolute classics. As much as they stand out as superb compositions of music and lyrics, so also are they are a landmark in song picturization in Hindi cinema. 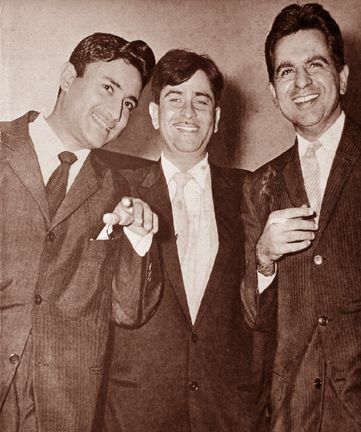 In among the star/music director partnerships that trended from late 40s and very early 50s, we saw three definite liaisons, Raj Kapoor with Shanker Jaikishen, Dilip Kumar and Naushad and Dev Anand with Sachin Dev Burman. All had exemplary music and memorable hits. In today’s terms when we look around, the music from Dev Anand-SD Burman combination has stood the test of time and has somewhere touched the Generation X as well. 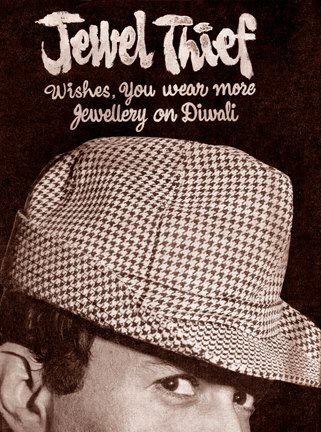 Diwali wishes from Ashok Kumar, Dev Anand and Vijay Anand in 1967 through this press release. Kishore was known as Dev voice and Rafi too has given a large number of songs as his playback, we have also heard Dev sing in the voices of Hemant Kumar, Manna Dey, Talat, Mukesh, Jagmohan Bakshi, Manmohan Krishna, Dwijendra Mukherjee, Chitalkar Ramchandra, and a few more. “A sort of romantic pairing of my voice with his (Dev Anand’s) screen image was created by Sachin Babu. People simply loved it. Those numbers were really popular. 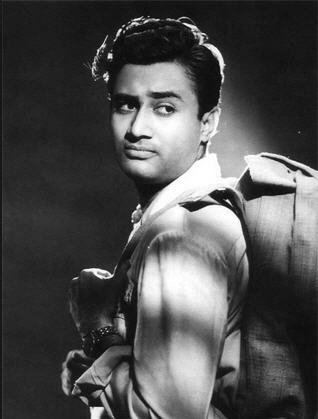 Dev Anand was a big name, a very prominent hero. His songs had to be very carefully crafted with lots of effort and dedication,” Hemant Kumar added. An ode to the beloved camouflaged in a ‘prayer’ to the “uparwala” – a delightful double meaning! Notice the use of the flute to replicate a tuneful train signal. I remember reading in an interview where Dev Saab had said he never influenced the producer with his (Dev’s) preferences in any department. 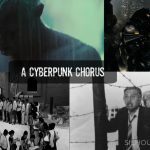 Not the choice of music director, lyricist, cast and crew. The producer had his own choices. C. Ramchandra did three films with Dev Anand, Husnlal Bhagatram provided music for six of his films, Anil Biswas did five, Kalyanji Anandji had four and Madan Mohan and Laxmikant Pyarelal scored the music for three films. Yet, the music from Dev’s films stands out. 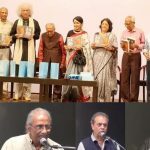 Anil Biswas in Raahi (1953) and Aaram (1951), C. Ramchandra in Baarish (1957) and Amar Deep (1958), Madan Mohan in Sharabi (1964), Salil Chowdhury in Maya (1961), Kalyanji Anandji with Johny Mera Naam (1970) are a few examples to prove the point. More so, when I list them in detail below, but let us visit these to understand my argument. ‘Ik pal ruk jana ruk jana o jane wale raahi’, by Lata in Raahi; a good lot of them in Aaram including, ‘Shukriya ae pyar tera shukriya’ by Talat, ‘Ae jaane jigar dil mein samane aaja’ by Mukesh and Lata, and ‘Man mein kisi ki preet basa le’ by Lata. ‘Dane daane pe likha hai khane wale ka naam’ by C Ramchandra in Baarish and ‘Dekh hume awaaz naa dena’ by Rafi/Asha in Amar Deep as well as Lata’s beauty, ‘Dil ki duniya basa ke sanwariya tum na jane kahan kho gaye’. The tandem of Geeta Dutt and Hemant Kumar ‘Kaise koi jeeye’ in Baadbaan (1954) is one of the most evocative songs ever, composed by Timir Baran and S K Pal. Madan Mohan’s Sharabi will for all times shine for great compositions to extremely sensitive lyrics by Rajendra Krishan and outstanding delivery by Rafi. ‘Mujhe le chalo aaj us gali mein’, and the two part ‘Sawan ke mahine mein’ give goose pimples even today when we listen to them intently. Yeh nai nai preet hai (Pocket Maar, 1956) – This film was Dev Anand’s 7th and last venture with Geeta Bali. The music was composed by Madan Mohan and lyrics were by Rajinder Krishan. Sangeeta Kohli Gupta ji (the daughter of music maestro Madan Mohan) mentioned this duet sung by Lata Mangeshkar and Talat Mahmood as “one song which I like very much” and it is a particular favourite of the author of this article. Maya had ‘Ae dil kahan teri manzil’ by Dwijendra Mukherji giving playback for Dev under Salil Chowdhury’s baton. Other ditties were ‘Tasveer teri dil mein’ (Lata/Rafi) ‘Jaare jare ud ja re panchhi’ (Lata) and ‘Koi sone ka dil wala’ (Rafi). ‘Pal bhar ke liye koi hume pyar kar le’, ‘Nafrat karne walon ke seene mein pyar bhar doon’ and ‘O mere raja,’ from Kalyanji Anandji’s Johny Mera Naam stand out and even the flop Mahal had Kalyanji Anandji create beauties like ‘Yeh duniya wale poochhenge’ and ‘Ankhon ankhon mein hum tum ho gaye diwane’. Mahal is probably the only film where we see Farida Jalal perform a cabaret, ‘Aaiye aapka tha hamen intezar’. The second highest music collaboration after SD Burman, was with RD Burman (RDB) – 11 films. Of these, Hare Rama Hare Krishna (1971), Heera Panna (1973), Ishk Ishk Ishk (1974), Joshila (1973), Shareef Budmash (1973), Bullet (1976), to name a few of 8 good ones. I believe Dev could not get the best out of RD Burman if you compare the music in these films with the maverick composer’s works with Ramesh Behl, Nazir Hussain, Hrishikesh Mukherjee or Gulzar. 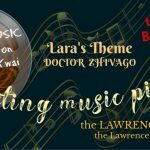 These combinations gave us far superior musical score. Something lacked in the partnership with Dev even though I have immense liking for all songs of Ishk Ishk Ishk and Joshila, and selected ones from other RD films for Dev Anand. Close third was Shanker Jaikishen – 8 films of which 7 were hits and have popular songs including Patita (1953), Love Marriage (1959), Asli Naqli (1962), Jab Pyar Kisi Se Hota Hai (1965) and Duniya (1968). Kahin Aur Chal (1968) was a non starter. 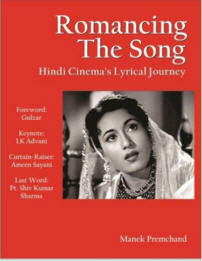 ‘Dheere dheere chal chand gagan pe’ (Love Marriage); the title song ‘Jiya o, jiya o jiya kuch bol do’ and ‘Teri zulfon se judai to nahi maangi thi’ (Jab Pyar Kisi Se Hota Hai); ‘Falsafa pyar ka tum kya jaano’ and ‘Dooriyan nazdikiyan ban gayi’ (Duniya); ‘Ik but banaunga tera aur pooja karunga’, ‘Tujhe jivan ki dor se baandh liya hai’ and ‘Tera mera pyar amar’ (Asli Naqli); ‘Yaad kiya dil ne kahan ho tum’, ‘Hain sabse madhur wo geet jinhen’ and ‘Kisi ne apna bana ke mujhko’ (Patita) are among Dev Anand’s most famous songs. Jaidev was a protégé of Navketan and an assistant to Dada Burman was launched as a music director in Joru Ka Bhai (starring Vijay Anand, 1955). His big career break was given to him in Hum Dono (1961). Each song is a gem. 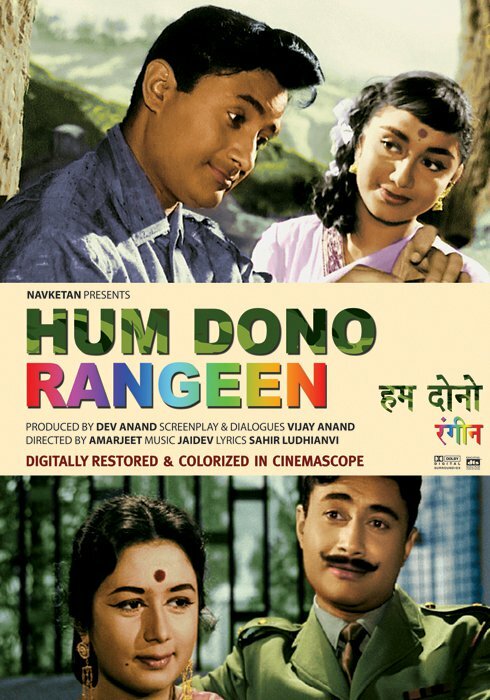 Poster of Hum Dono Rangeen, the re-titled colour version which released in 2011. Hum Dono has remained as one of the highly popular films of Navketan. It had Dev in the famous double role and his very stylish moustache. Amarjeet, a Navketan insider was credited as its director, though in an interview Dev confirmed that most of the film was directed by Vijay Anand. Allah tero naam (Lata), Abhi naa jaao chhod kar (Rafi, Asha), Main zindagi ka saath nibhata chala gaya and Kabhi khud pe khabhi halaat pe rona aaya (both Rafi), are all excellent numbers and have become famously proverbial. Jaidev next did Kinare Kinare (1963) for Dev Anand, co-starring Chetan Anand and Meena Kumari. Chale jaa rahe hain mohabbat ke mare and Dekh li teri khudayi were hits here. Peculiarly, in all those years (late 50s to mid 60s) when Dada Burman was using Rafi as Dev’s voice, all other music directors for Dev’s films followed suit. Shankar Jaikishan in Asli Naqli, Love Marriage and Jab Pyar Kisi Se Hota Hai, Salil Chowdhury in Maya, Madan Mohan in Sharabi are points to exemplify. Once Kishore came back with Gaata rahe mera dil in Guide, SJ quickly added Kishore in Duniya duet Dooriyan nazdikiyan ban gai. Good for Kishore who was always identified as Dev Saab’s voice. Dev Anand was fortunate to have some of the best directors of the industry direct him in his early years. 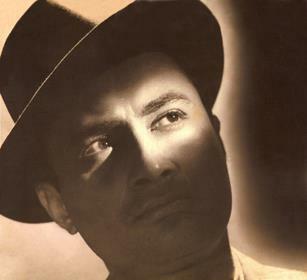 Phani Majumdar directed him in 4 films including Faraar and Baadbaan. Paul Zils did two including Zalzala, which had an amazing score by Pankaj Mullick. 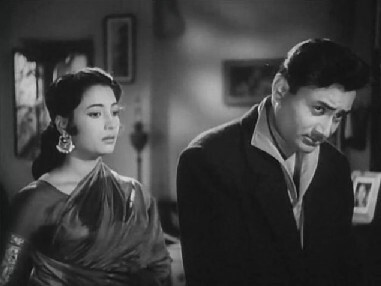 D. D. Kashyap worked with Dev Anand in three including Aaram and Maya. 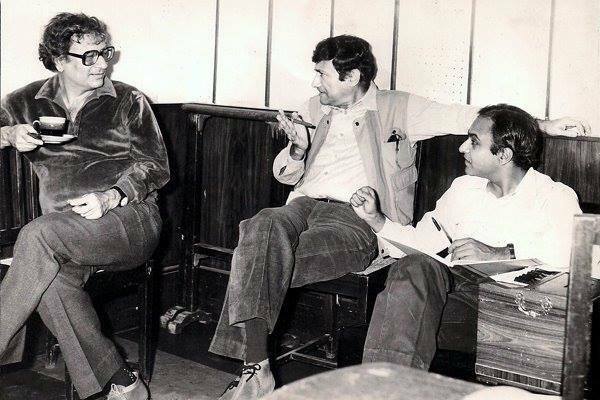 The major contribution came from Vijay Anand (Goldie), who directed 10 films for Dev Anand almost all masterpieces and examples of outstanding film making in all departments. Any revisit to these classics – Nau Do Gyarah, Kala Bazaar, Guide, Jewel Thief, Johny Mera Naam, Tere Mere Sapne reveal new strengths and finer qualities that a viewer might have not noticed earlier. Vijay Anand brought out the best in Dev, in acting, in songs, in style, everything. 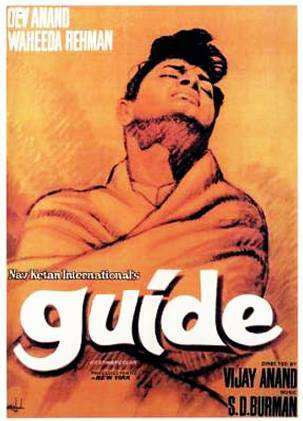 Naseeruddin Shah in an interview declared Vijay Anand as one of the best directors in Hindi films, even equalled him with Alfred Hitchcock. 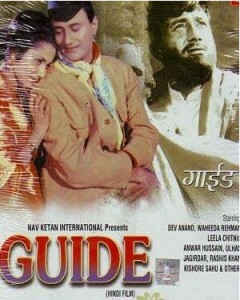 The poster of Guide is the most expensive poster. It is priced at more than one lakh rupees. Older brother Chetan did 7 films including Afsar, Taxi Driver, Funtoosh, Kinare Kinare, Jaaneman. Dedicated film maker Shankar Mukherji (Debendra Shankar Mukherji, his full name) did 7, remember, Nirala, Baat Ek Raat Ki, Pyar Mohabbat and Banarasi Babu? Raj Khosla directed Dev in 6 films including CID, Kala Pani, Solva Saal, Bombai Ka Babu and Shareef Budmash. Khosla came to Bombay with a reference from Dev’s eldest brother (a lawyer) in Punjab. Dev placed him under friend Guru Dutt to learn the craft. That Raj Khosla rose to become a highly successful film maker shows Khosla’s dedication and commitment. Let me mention his leading ladies now. The magic number seems to be 7. He did seven films each with, Suraiya, Geeta Bali, Waheeda Rahman, Hema Mali and Zeenat Aman. Let me recall a few with each one of them; with Suraiya (Afsar, Sanam, Vidya, Shair). With Geeta Bali (Baazi, Jaal, Milap, Pocketmaar); Waheeda acted with Dev in CID, Solva Saal, Kala Bazaar, Guide, Prem Pujari; with Hema there were Johny Mera Naam, Shareef Budmash, Tere Mere Sapne, Joshila, Amir Garib, among others. With Zeenat it was, Hare Rama Hare Krishna, Heera Panna, Ishk Ishk Ishk, Warrant. Dev’s affair with Suraiya was the talk of the town, other than that Dev was not known to have any affairs with his leading ladies. He mentions about his attraction towards Zeenat in his autobiography, but denies there was anything beyond. The only heroine he acted in more than 7 films was the effervescent Madhubala, it was 8 that they did together. Aaram, Nadan, Arman, Kala Pani, Jaali Note, Sharabi, among others. Kala Pani (1958), a remake of the Uttam Kumar-Suchitra Sen starrer Bengali hit Sabar Upare (1955) remains my favourite. Madhubala was in the role of a journalist which she repeated in Shakti Samanta’s Jaali Note. Incidentally, CID and Jaali Note are only 2 films that Dev had O P Nayyar providing music for, both hits. In the Jaali Note song, the Censor Board found the words Raat sard sard hai a bit too sensitive and had them cut retaining only Chand zard zard hai twice instead! Poor Chand remained zard without the sard raat. Dev Anand did 6 films with the heroine he decided to make his real life partner, Kalpana Kartik among which Baazi, Taxi Driver, House No. 44 and Nau Do Gyarah are prominent. Kalpana Kartik (Mona Singh in real life) never acted opposite any other hero, other than Dev. Kalpana Kartik who later became Dev Anand’s wife worked in six films with him, including Chetan Anand’s Aandhiyan. With Nutan and Meena Kumari he acted in 4 films each. With the graceful Nutan he did Barish, Paying Guest, Manzil and Tere Ghar Ke Saamne. With Meena Kumari he did Sanam, Tamasha, Baadbaan and Kinare Kinare. Raakhee acted opposite Dev Anand in Heera Panna, Loot Maar, Banarasi Babu, Anand Aur Anand. Nalini Jaywant also did four films with Dev Anand – Kala Pani, Hindustan Hamara, Raahi and Munimjee and the songs of Munimjee and Kala Pani especially are popular till today. Three was it for Vyjayanthimala, Amar Deep, Duniya and Jewel Thief. Three also with Asha Parekh, Jab Pyar Kisi Se Hota Hai, Mahal and Kahin Aur Chal. Nanda did three films too Hum Dono, Teen Deviyan and Kala Bazar though in Kala Bazar she is in a sister’s role to Dev. Tina Munim did Des Pardes, Loot Maar and Basu Chatterji’s Pygmalion, Man Pasand. Asha Bhosle only hums in tune in this Kishore delight. Notice how the music inspires. Director Subodh Mukherji had a great song in his hands and picturised it with due dedication and intelligence. Dev Anand was the only Hindi film hero to have acted in two films with Suchitra Sen, the Bengal marvel – Sarhad and the unusual love story Bombai Ka Babu (both in 1960) – the latter still remembered for outstanding performances and great songs. Sadhana had two hits with Dev, Hum Dono and Asli Naqli, films in which she was a perfect picture of impish beauty. Suchitra Sen and Dev Anand in the unusual love story Bambai K Babu. 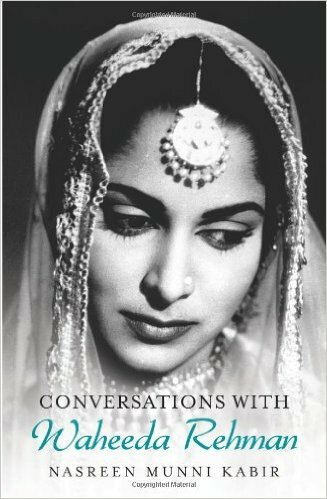 Zaheeda, daughter of Akhtar Hussain (elder brother of Nargis) actually insisted Dev to give her a break. Thus, Dev Anand cast her in Prem Pujari and Gambler. She will go down in movie history with some excellent songs in both the films, composed by maestro SD Burman. Zahira got a break in Gambler too, playing the cute sister. Mumtaz gave one of her career best performances in Tere Mere Sapne and was impressive in Hare Rama Hare Krishna. Both films were well received and appreciated and she got some outstanding songs too. And who can forget the ever popular songs of Maya and Love Marriage, the two films in which Mala Sinha played the female lead. 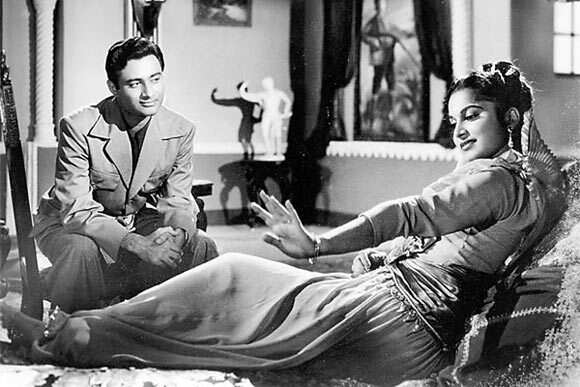 Shiela Ramani was Dev Anand’s heroine in Funtoosh (1956), remember the song ‘Hamen aaj koi na chhediyo‘? She played the second lead in Taxi Driver (1954), dancing to the most popular Lata club number ‘Dil se mila ke dil pyar kijiye, koi suhana ikraar kijiye’. Both films had excellent hit music by SD Burman and both were directed by Chetan Anand. The one film partnerships he had were with Nargis (Birha Ki Raat), Bina Rai (Insaniyat), Saira Banu (Pyar Mohabbat), Sharmila Tagore (Yeh Gulistan Hamara), Yogita Bali (Banarasi Babu), Parveen Babi (Bullet), Priya Rajvansh (Saahib Bahadur), Smita Patil (Anand Aur Anand), among others. Tanuja (Jewel Thief) played a supporting but significant role opposite Dev Anand. In almost all Navketan (Dev’s banner) films, the heroines were not mere showpieces, they had solid ground to stand on their own and have a defined identity. Some times, they were uber modern and surprised the audience but Navketan films banked on making the female characters rise above the ordinary. Waheeda Rehman playing Rosie in Guide made a bold statement much ahead of its’ time and in Kala Bazar, she stood tall as Dev Anand’s alter ego, a picture of his conscience. In Solva Saal, she was the gutsy girl eloping with her lover and in CID the spunky ‘Kahin pe nigahen kahin pe nishana’ won hearts. Geeta Bali in Baazi and Jaal, Kalpana Kartik in Taxi Driver and Nau Do Gyarah, Madhubala in Kala Pani, Suchitra Sen in Bombai Ka Babu, Hema Malini in Tere Mere Sapne, Zeenat in Hare Rama Hare Krishna, these are all stand out female leads that have crafted future for other heroines in Hindi films to follow in times to come. Dada Saheb Phalke award winner ace cameraman V K Murthy, whose works in Guru Dutt, Pramod Chakraborty and Atmaram’s films among others is legendary was a Special Invitee Member for our Bangalore based Vintage Hindi Music Lovers Association. I have had the privilege to have lengthy talks and discussions with him during those years. He informed me that the entire style, the clothing, a cap, way to deliver dialogues, the gait and posture, the camera angles, handling of cigarettes, and all such things were planned out collectively by Dev Anand with Guru Dutt while working in Baazi. Others who were part of this discussion to conceive the shots were Fali Mistry and occasionally, VK Murthy himself and Balraj Sahani. It was a well chalked out strategy. One can see shades of it carried out by Guru Dutt in Aar Paar as well. But Dev adapted to it naturally and made a hit out of it all through his career. On technical side, a very large number of his films had the acknowledged industry top cinematographer, Fali Mistry handling camera. Fali also directed two films, both with Dev, Sazaa and Armaan. Also, V. Ratra did many films as his cinematographer. Ratra was a relative of Dev’s. In later years D K Prabhakar took over. Some films were done by V K Murthy and Jaal Mistry as well. All of them were master craftsmen and that added to the slick quality to his films. His films look modern even today. 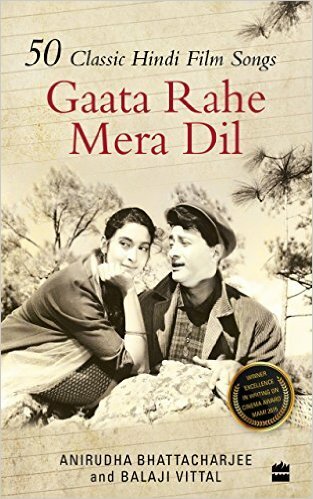 As Sidharth Bhatia writes in his The Navketan Story-Cinema Modern, “Dev Anand could never play Devdas, the quintessential defeatist Indian male protagonist.” There were no dull moments for Dev, no defeat, no surrender to alcohol or circumstances or lost love. He was always the bright shining side of life. Hope and struggle and victory were his motto. Even in a dying Raju in Guide there was hope and a class of high spiritual attainment. Dealing with grief and sadness were never turning maudlin for Dev Saab. If I have to plan a festival tribute on Dev Anand, my pick from his films would be, Baazi, Funtoosh, CID, Kala Pani, Hum Dono, Kala Bazaar, Guide, Jewel Thief, Johny Mera Naam and Tere Mere Sapne. It has all the variety an actor could have. Parag Sankla: Thanks to Peeyush da for such a wonderful article. 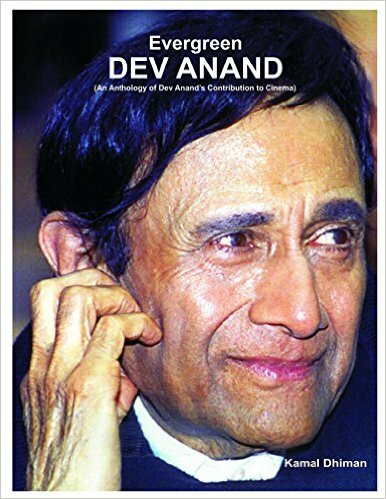 Antara: Dev Anand… 3 generations of fans in the family – starting with my mother, and then me and now my 10-year-old daughter… one star whose appeal never fades, although the century turned a corner…. Lovely journey down memory lane, exploring the illustrious repertoire of the evergreen hero on his birth anniversary today and remembering all those super-talented people who worked with Dev Anand and added to his magic. Gajendra Khanna: He is our family favourite too. Thanks for writing on him! Lakshmi Priya: Dev n his music…timeless. Debasish Bhattacharya: Great article on a famous persona like Dev Anand. Loved reading through……. Nagaratnam Kotturi: Even our family is a great fan of Dev Anand and his songs . In fact my brother shares his birthday also with him i.e. today. Suman Sen: Happy Birthday Dev saab ,, har phikr ko dhuey mein udata chala gaya. Raveendra Bhate: He was a real Maverick! Stylish to the core. Loved him and the songs of course. 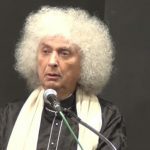 Gaurav Sahay: A fantastic comprehensive write up spanning Dev’s career and his associations with so many cine actresses, Music directors and Directors. Dev stood strong in all the changing times and enthralled millions with his ability to produce cinema comprising gripping story, great music , words and lastly the debonair classy looks with a streak of intelligence written all over, Dev will always be reckoned as a strong chapter in hindi cinema. My compliments to the writer who encapsulated every aspect touching Dev impecting imperceptibly the every reader. Deepa Buty: Lovely write up. And awesome Dev songs. Enjoyed it thoroughly. But then if its about Dev, it has to be great!! He’s the one who brought charm, style & effervescence in Hindi films. Kusum Saxena: Superbly written by Peeyush Ji, I got the opportunity to see him during the shooting of Guide. It was in Udaipur, Rajasthan… during the shoot of the song ‘Piya tose naina laage re’… first line…… thanks. Aradhana Gupta: Thanks Peeyush Sharmaji & Sundeep Pahwaji for this highly informative & wonderful article. I would like to know a thing or two about ghost voicing of Manmohan Krishna for Dev Anand.I belive there was a song in Dev Anand starer film Aaram in the voice of Manmohan Krishna which was picturized on himself.Is there any other song by MK which was picturized on Dev Anand? 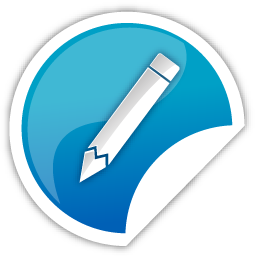 Peeyush Sharma: Aradhana ji, Thanks for your comments and blesings. Manmohan Krishna sang for himself in Aaram (Zindagi hai yo yo) I have seen the film. In Afsar there were 2 songs, one he sings for himself, in the second, half is on him and then Dev Anand lipsyncs the other half. May not have been originally planned, but was shot that way. I share this information from two persons who had seen Afsar and remember this distinctly, the two are not connected, not known to each other. Aradhana Gupta: Thanks for introducing me to two very rare songs of Afsar. First tune was used by LP in 1980, for a song composed for film Suhag. Very good, deep and detailed information about the great Legend which every DEV fans and followers Must read. His debonair personality which exceeded his screen presence is ever appealing. A courageous man who could reveal almost everything of his life so candidly….. Truest to the essence of “main zindagi ka saath nibhata chala gaya”……. Excellent! Just too good… . He was my favourite too! I have a vague memory that as a kid, of seeing him during shooting of 1957 “Dushman”, at the Bund Garden bridge (near Pune Station). During the song shooting “bahar aayi ghata chhayi”. He was definitely a style icon . Loved him in Taxi Driver, Funtoosh, Nau Do Gyarah, Kala Pani , Guide and yes Johnny Mera Naam and many more ! He had a unique style of dialogue delivery which we fans were crazy about . Like suppose, he has to say “tasveer do hain, lekin hum ek hain” , now whilst saying this Dev Saab would say ‘tasveer do hain” (pause), then he would raise his voice a bit and stretchingly say “lekiiinnnn” and smile a bit plus nod his head vigourously (as if saying yes), and say “Hum ek Hain” !!! Ahaaa… that was truly our Dev Saab for sure….. We surely miss him ! A pleasant experience of going down memory lane… of exciting times in cinema, many of which are are long forgotten. Dev Anand was in the ascendancy at a time when Gregory Peck, Humphrey Bogart, etc. were ruling in Hollywood… The memories have come crowding back. Illustrations are captivating. So are your words. Thank you, Peeyush. Thanks to all for appreciating, I am humbled by your praise. Moti Bhai, I am so happy you liked it. Dev will remain immortal as long we fans are alive and his music will go beyond. Truly timeless. Wonderful tribute, Peeyush Ji! Thoroughly enjoyed reading! Particularly liked Dev Anand’s reflections on SDB! Great posts, really amazed to know the real life about Dev Saheb. Super evergreen actor. Great article to read Peeyushji. Just noticed out of the 10 films you selected for a festival of Dev Sahib films five are by his brother Goldie. To add about the time when Navketan was to celebrate its 25th Annv,both the brothers Chetan and Dev keeping their differences apart collaborated once again after many years. Chetan Anand agreed to direct the Taxi Driver remake Janeman and Dev Sahib worked as a leading man in Himalaya Prods Sahib Bahadur. 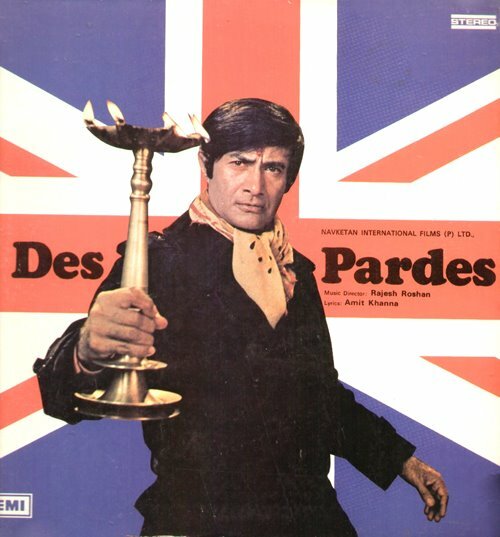 As far as I remember Janeman may not be a jubilee hit but was no less successful than Des Pardes. Maybe Dev Sahib once more wanted to have an upper hand while commenting for his brothers directorial venture Overall the three brothers would remain a milestone in Hindi Films. My own liking would be that Goldie would have an edge. Thanks again to all for appreciating. Yes, Sundeep ji. Jaaneman ran pretty well, but Dev wanted it his way I guess. My preference was always Goldie, as I believe he was one of the best Hindi cinema has witnessed. The repertoire I selected represents the ever best of Dev, the films that have a repeat value and can be enjoyed any day, yet, show the star in his best. A wonderful write-up on Dev saab, one of the most loved Hindi film artists, a great man, an upright man. Kudos to Shri Peeyush ji for such an informative and interesting write-up. In his biography, And Pran, Pran mentions that there were 2 film personalities he respected the most, for they would not get into any petty talk, were true professionals and always with positive attitudes, one was Ashok Kumar and the other Dev Saheb. Too many people in the industry, quietly hold Dev Anand in high esteem. 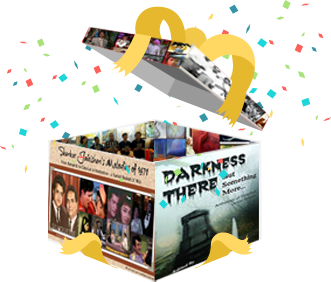 So many careers have been launched or helped to, by Dev. For us fans it is his films that matter and their music, immortal and timeless. Very interesting write up Peeyush ji.